Led by our Music Director Steven Roberts, we offer 4 exciting concerts a year, often supported by a professional orchestra, at various quality venues including the RNCM. We work with excellent soloists, again often professional, who return to sing with us time and again as they appreciate our musicianship and well-organised concerts. Music performed ranges from baroque to newly commissioned pieces. 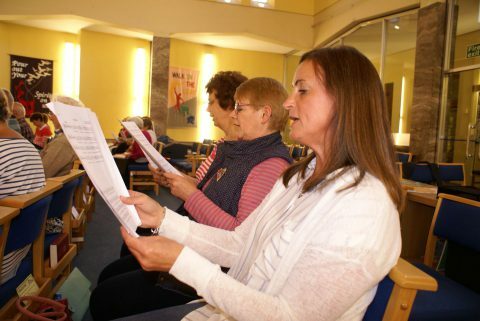 We hold regular Vocal Training workshops to help our singers further develop their skills. We hold a popular Singing Day each year, giving non-members the chance to join us for a very special day. The quality of our concerts has led to us being regularly invited to take part in concerts arranged by other promoters. In recent years we have sung with Russell Watson at Gorton Monastery, the Lowry Theatre and the Bridgewater Hall and with Lesley Garrett at Huddersfield Town Hall. We have regular tours, enjoying a weekend of singing and socialising at attractive venues, e.g. a recent tour to Hexham Abbey and Carlisle Cathedral. We support a selected charity each year, raising funds for it at our Christmas concert and other events throughout the year. Altrincham Choral Society is an independent, self-funded charity (Registered Charity No. 500729). Steven has been Music Director since 1994 and brought with him a wealth of experience. He has continued to bring innovative programmes and inspire performances of a very high standard. He is Music Director and Conductor of Altrincham Choral Society, Chesterfield Philharmonic Choir and Honley Male Voice Choir. He is an Adjudicator Member of the British and International Federation of Festivals and regularly adjudicates throughout the United Kingdom. He is also Chairman of the Board of Trustees of the Federation. Prior to 2006, Steven combined his musical activities with a full-time post at Barnsley College. He has worked with the Huddersfield Choral Society and the Liverpool Welsh Choral Union. He has conducted numerous times at the Royal Albert Hall, London and many other prestigious UK concert halls. He has also conducted in St Peter’s Basilica in the Vatican City, St Mark’s in Venice and many other sacred settings including Florence, Sorrento, Amalfi, Milan, Austria, Paris, Bavaria, Montecassino, Barcelona and Poland. He is also Musical Director for COAL, the award-winning contemporary dance piece choreographed by Gary Clarke. The piece is set at the height of the 1984-85 Miners’ Strike and is currently touring the UK featuring live brass music. He has worked with many choirs, brass bands, orchestras and wind bands and continues to work in a variety of musical settings. While at Leeds University he was twice winner of the University’s Composition Competition. He has also been the recipient of other national prizes such as the Schouller Organ Composition Prize and the Wallace Ensemble Prize. He has since enjoyed a number of commissions from a variety of bodies, from small chamber ensembles through to large-scale choruses and symphony orchestras. These have led to performances across Europe and America. David has also written music for television and theatre. Some highlights included Primal Fire for massed children’s choir to celebrate the relay of the Olympic Torch through Runcorn, and The Fate of Chattox written for clarinet and piano to mark the 400-year anniversary of the Pendle Witch trials and was featured in a BBC Radio 4 documentary. Having spent seven years as Head of Music at Cronton Sixth Form College in Widnes where he was instrumental in the college being designated as a Centre of Excellence for Performing Arts, he now oversees Music at Loreto College in Manchester. He has developed a new type of musical analysis designed to deepen the understanding and enjoyment of classical music, and is much in demand as a music consultant in other schools and colleges. Lydia has been our Accompanist since 1996. She is also a very talented concert pianist and regularly performs solo items in our concerts. She is a graduate of the RNCM where she studied piano, harpsichord, violin and singing. She specialised in piano accompaniment at postgraduate level. Her professional concert career started as a winner of the North West Arts Young Musicians’ Platform and also with concerts awarded through the Live Music Now scheme, founded by Sir Yehudi Menuhin. She won a British Council Scholarship towards concerts and recording work in Hungary, where she gave performances at the University of Budapest, the residence of the British Ambassador and the Kodály Institute. Lydia regularly accompanied master lessons with John Cameron and Peter Pears. She performed in master classes for Bernard Roberts and Vlado Perlemuter. She has performed many times at the Royal Exchange Theatre for the Manchester Midday Concerts and also at the Purcell Room, and appeared as concerto soloist at the RNCM as well as recording for BBC radio and television. Lydia has toured extensively as soloist and accompanist in Sweden, Germany, Switzerland, France, Italy and throughout the British Isles. Her concert repertoire is wide-ranging. Lydia teaches at Manchester Grammar School and Loreto Grammar School in Altrincham. She has many successful professional musicians among her past pupils. Roger has been our President since 2009 and is very active, often attending our rehearsals and supporting our concerts. He studied composition and piano with Professor Franz Reizenstein (a distinguished pupil of Vaughan Williams) at the Royal Manchester College of Music. He went on to London University to complete a teaching degree, specialising in primary school music. He has held posts as permanent Musical Director for Sale Operatic and guest MD for the Trafford Margaretians and Urmston Operatic Societies. He has composed five full-scale musicals, ranging from The Royal Rose (based on The Prisoner of Zenda) to Jane Eyre. He founded the Stage One Orchestra which has continued to play annually in the Trafford Young Composer and Poet Competition. Roger began this venture in 1992 to give youngsters a unique chance to hear their compositions and poems performed live, in front of sell-out audiences. He also devises an annual Concert for Children involving hundreds of young people. These are fun evenings where the children can join in with games, and have practical music experiences with the Orchestra. He has been guest conductor of Manchester Opera Orchestra and Hale Light Orchestra and is principal conductor of Northenden Senior Choir. He has been on the judging panel of Sale Festival Junior Choir Competition for several years and regularly helps in the organisation of Altrincham and District Schools’ Music Festival. He has been commissioned to write songs and nativity presentations for Trafford schools. Latterly, he has returned to composing larger scale works for adults including The Poppies Blow, premiered by ACS in November 2014. Roger was made a Freeman of Altrincham for his services to music in the Borough in 2015. We appreciate and acknowledge the support of our Patrons and Sponsors. ACS is managed by a Committee of Trustees elected by the Society’s members at the AGM in October each year. We also have a Music Sub-committee that reports to the main Committee. For further details see the Committee page. View our archive of photographs taken over many years at various concerts, concert tours, rehearsals and other events.